LATEST: Watch the NASA press conference above, which should begin no earlier than 12:30 PM ET, to learn more about what happened during today’s failed CRS-7 mission launch. UPDATE: The SpaceX rocket seems to have broken apart entirely in what looks like a major mission failure. During the feed, the rocket start smoking and then appeared to come apart altogether about a minute or more into launch. The resupply mission was thankfully unmanned. 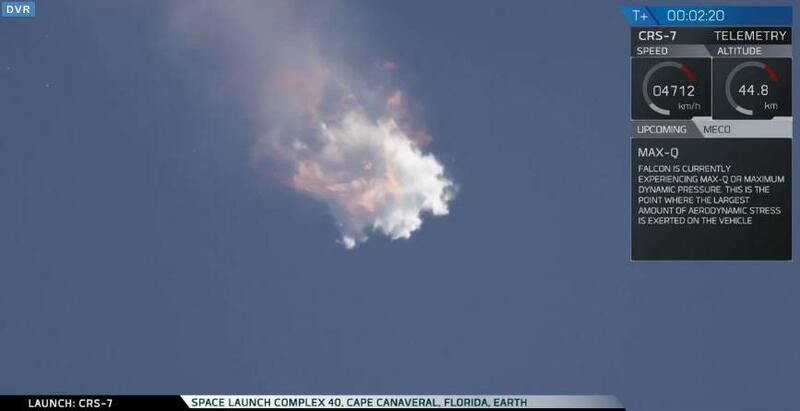 This is the first major failure for a Falcon 9 mission, which number 19 total and date back to 2010. UPDATE 3:NASA will host a press conference on the failed launch later today, currently planned for 12:30 PM ET (9:30 AM PT). CRS-7 was a resupply mission, but astronauts on board the International Space Station don’t appear to be in any danger of running out of essentials as a result of this failure. Microsoft was putting its HoloLens augmented reality tech in space for the first time as part of CRS-7’s cargo, however. Above, the feed for SpaceX’s CRS-7 resupply mission for the International Space Station is live. The streaming begins at 10 AM ET, with a liftoff targeted for 10:21 AM ET. The mission also includes another attempt by SpaceX to recover its Falcon 9 reusable rocket stage, via an ocean-borne automated drone barge that doubles as a landing platform. SpaceX “>almost nailed the landing last time, with its CRS-6 launch on April 13. SpaceX CEO Elon Musk has been tweeting pictures of the drone ship ‘Of Course I Still Love You’ leaving port and preparing for this test. After last time’s near miss, his team is probably extra optimistic about its chances to nail the landing today.